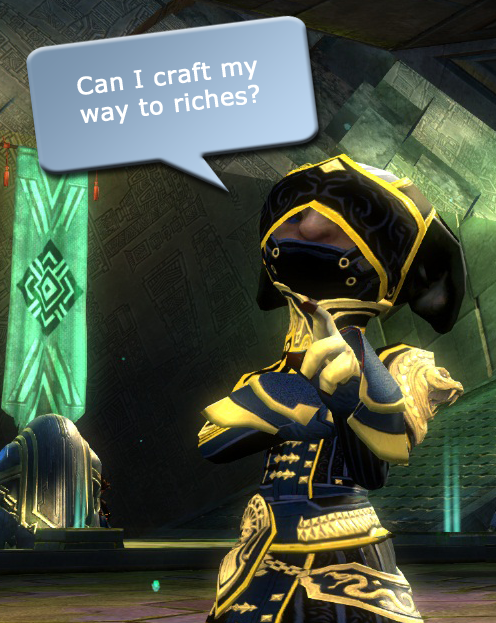 Theoretically there are ways to make money by crafting but some market prices aren't very supportive of this ambition. In fact, today while browsing the market something struck me: Vanilla Beans should be exotic. The fix to old power levelled cooking (which also led Tyria towards its current status as a buttery nation - "Why do all these bags have butter in them?") also made some cooking ingredients much more rare than others. Much more rare. Vanilla beans are needed for making bowl of bakers wet ingredients. 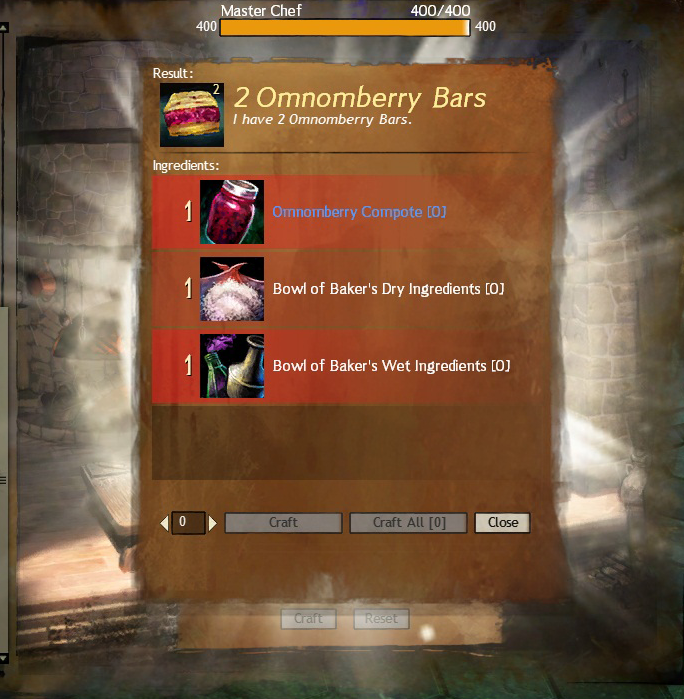 Which is in turn required for my favourite buff treat in the game at the moment: Omnomberry Bars. These are awesome. For those who don't know the buff is +10 experience from kills, 30% magic find and 40% increased gold from monsters. I'm looking at you Vanilla Bean ಠ_ಠ (tecnically it's omnomberry's fault too - but he's a top tier ingredient so we'll let him off) . Maxed out craft skills should give you benefits. With a direct approach (we'll come back to that later and in future articles) it's not happening. But it's not all doom and gloom with professions. Say you're a masochist and you're trying for Dusk or The Legend. Let's also say you've decided the mystic forge is the way you want to go about it you brave, brave gambler you. In this scenario, you can save costs when the market is favourable by crafting the 75+ rare swords or staves you chuck into Zommoros' bottomless belly. This isn't making you money though. It's minimising the cost of a legendary endeavour. It's still good but if you could craft to make sufficient profit you'd perhaps be better off chasing the ever increasing price of the pre-cursor's on the TP instead of gambling. Right now we're still in an erratic market period roughly 2 months after launch. It takes a while for economies to level out. Even so, it's obvious to me that professions will be profitable in the long run. How can I be so confident? Let's look at omnomberry bars again. It's a great buff but right now, even if you know the recipe, it makes sense to buy the bar from the TP rather than craft it. Even if you have the materials required it makes more sense to sell those and buy the bar right now. This can't continue though. A lot of the bars keeping the price low are no doubt from players who stockpiled when the recipe made 7 instead of 2. When the market rights itself after this change, the fact that most are buying (instead of making) bars will mean they dry up and their price will increase. Markets aren't altruistic. No master chef is going to craft these at a loss. But will there be profit? There's never been more of an incentive in a popular MMO to level crafting (you gain experience - 10 levels for 1 - 400 each crafting skill). You can also level all 8 if you choose - and if you can afford it. Characters choosing crafting as a level booster will buy as many of the materials required to make food buffs as they can afford (increasing the demand/cost for materials). There's little demand/great abundance of crafted goods made while levelling crafting. Higher levelling recipes often require many of the same ingredients as higher recipes (older cooking guides require lots of vanilla beans because they were bulk bought from karma vendors). Demand for higher recipes remains constant; cost of materials increases due to players levelling alts. I find this fascinating and I'm sure Arenanet (with a paid economist on staff) is aware of it. Perhaps their thought process is that we're already rewarded for crafting in terms of experience. Perhaps they'll take a corrective stance if things don't level out (I believe they will) even though each time they change something, the ripples take a while to settle down. So, crafting for profit - who's doing it? Who is waiting for changes to the crafting landscape courtesy of Arenanet? I have to admit the current situation is something that's much more refined, complex and tasty than in other MMOs. u made a mistake with the omnomberry bars, u make 2 of them with crafting, so it should be 4s42c. You mean the copy pasta from gw2db? Yeah there are 2 produced (I mention that later) but gw2db don't have that included - you have to change the cost in your head to account for recipe. I should have made that clearer. Will update now. Even with two you still come out below the crafting mats cost without even factoring the fee in. Right now I'm leveling crafting (artificer, chef) as I go but I'm not really doing it for profit. Especially since Chef can be quite rough to level and the amount of wood needed for Artificing is pretty huge. That said thanks for the tip on the bars. I know they are very useful but I don't have the recipe yet. When I do I'll be sure to buy them instead of crafting them. I made some money by selling rare unidentified gray dyes, but then someone posted about it and the prices of coriander seeds doubled while the price of the dye itself lowered. Not much gold to be made from cooking since then imo. Rather flip the materials. You can occasionally turn a profit selling level 400 orichalcum jewels. I always assume that I'm buying all the materials (30 orichalcum ore, 5 ectoplasm and 5 orbs for a ring) because I don't know how to price my time spent harvesting. On some days a rng will bring a 35-35 silver profit. Most of the time though you're looking at a 1-5 silver profit or a loss, and that's assuming no one starts to undercut the offer price (which is extremely likely). And the amount of time it takes to cycle through all of the possible orichalcum jewels and figure out the profit margin takes long enough that most day it feels like less of an effort to eat some omnomberry bars and go kill risen in Orr.